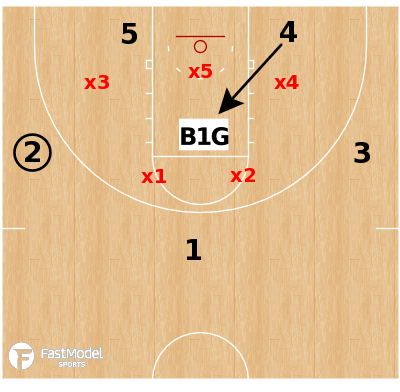 Zone Offense tips from the Wisconsin Badgers and their high post decision reads as they head into the wide open East Regional. The Wisconsin Badgers are back in the Sweet Sixteen. A late season swoon in Big Ten play makes this feel like a surprise, but it really is not. The Badgers have been a consistent force in the tournament in recent years behind the strength of their patient, disciplined and fundamental style. Are the Badgers innovative or cutting edge? Probably not. But effective? Yes. Here’s a look at the how Wisconsin attacks 2-3 Zone by playing through the high post. Nothing unique here aside from effective zone offense and the simple surgical precision with which they execute. The Badgers use traditional offensive spacing against 2-3 with players stationed in the gaps at the apex of “perfect triangles” between two pieces of the zone. Two players begin behind the zone and a player remains behind the zone as the possession continues. 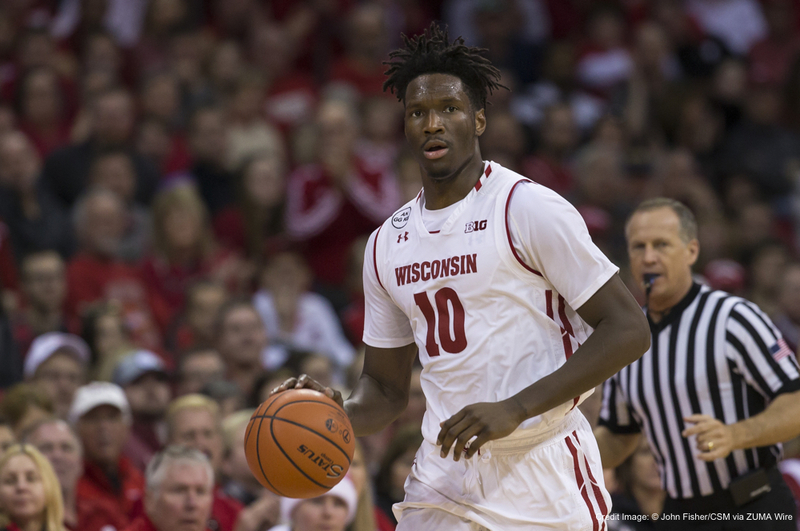 A forward, most often Nigel Hayes, flashes into the “logo” area seeking a pocket of space in the belly of the zone. 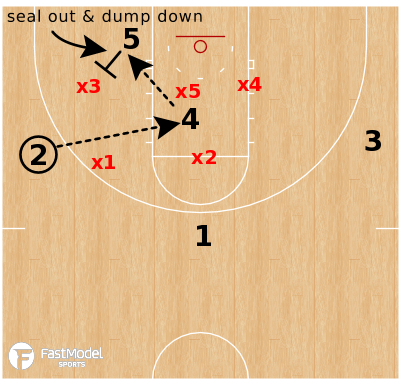 Teach players to “lurk” in this area and find a crevice where they can receive an entry pass. Upon receiving the pass in the high post area, the decision reads from there make or break the possession. As always, catch to shoot first as you are never more open than you will be at the moment you catch the ball. As the player flashes into the logo area he/she is thinking shot first. Organize the feet and be ready to shoot on the catch. Should the middle of the zone step up to contest the shot from the logo area, the next read is the high-low dump down to the player in the “porch” behind the zone. 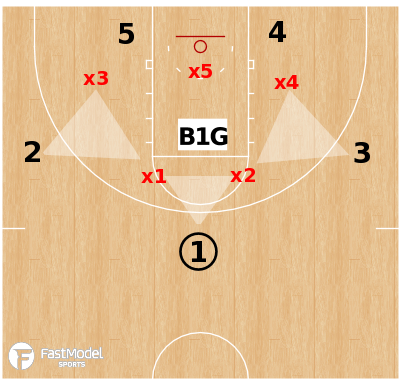 A 2v1 as been created against the interior defender (X5). But beware of false daylight! The best zone teams are taught to pinch down hard to the blocks from the forward spot upon the high post entry. You may be able to whiz the ball through to the player behind the zone, as Wisconsin does several times in the video below, but it must be a rapid decision. Against excellent pinching zones consider teaching the player behind the zone to seal out the pinching forward to receive the high-low pass (see diagram above). The high post entry effectively collapses the defense. This can present an inside-out opportunity if no shot or high-low dump is available. 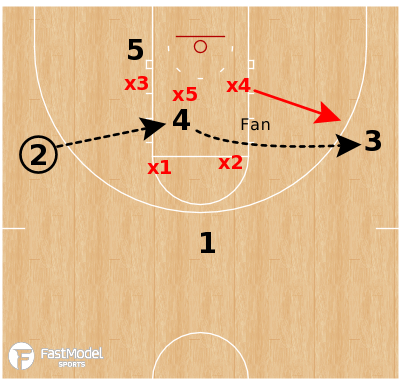 The third read is to “fan” the ball to the weakside. The forwards pinch upon the entry leaving them vulnerable to the fan. 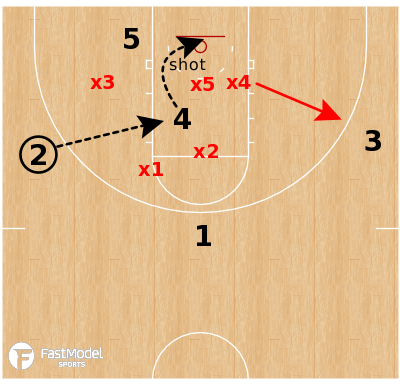 Again, the player who receives the weakside fan is preparing to shoot on the catch (One Count shot) or drive the momentum of the closeout once the defense expands. Do not hold the ball and allow the defense to reorganize. Another option on the high post entry is the cross cut. The player behind the zone cuts under the rim and attempts to seal out the opposite forward. Coupling this with the wings “flooding the baseline” and you have created a dilemma for the defense. The forward is left with the decision to battle 5 in the paint or defend the corner. 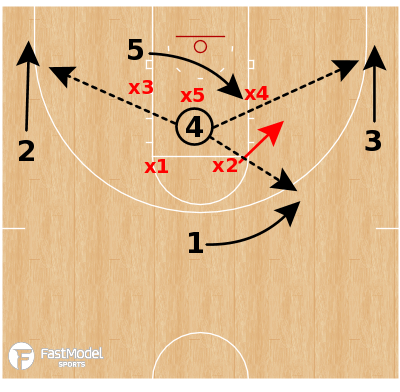 Should a guard (X2) chase the wing to the corner the top player (1) can cut into the vision of the high post for the fan. The high post entry and the corresponding cuts have effectively disorganized the defense. Playing through the high post requires a decision-maker to catch and instantly compute the proper option. Wisconsin has that player in Hayes and may potentially face a zone team (Baylor) in the Elite Eight. Once again following these decision reads could land the Badgers in familiar territory – the Final Four. For help with practice planning and implementation of a conceptual-based offensive attack including the player development tools needed, join our community of basketball coaches!